These days, people are equating student loans with the words “lifetime debt”. While the numbers tell the tale – 30% of student loans in this country are in default – there is much more going on. Here’s information that’s definitely “need to know”. There’s more than one trillion dollars owed in student loans in this country and each month, we add close to $60 billion more to that number. And that 30% delinquency rate? That’s on the rise, too. We’ve already seen a new trend associated with both student loans and credit card debt. That trend includes a cycle of applying for and receiving student loans to attend college, only to realize the loans don’t cover all expenses. A college student then might apply for a credit card. Soon, she has both student loan debt and credit card debt – with no way to repay it. A growing number of these students are abandoning their college educations in order to go to work to pay off that debt. So not only must they repay loans for an education they didn’t get, they’re also setting themselves up for a tough road to financial freedom. It makes sense, then, that many 20-somethings are considering bankruptcy. Adding a new dimension to the scenario is the lack of available jobs. Let’s face it – a jobs number that fluctuates a tenth of a percentage point isn’t an improvement, especially considering how the past several months the Labor Department has published revisions to earlier months. That 94,000 jobs the government said was added last month soon became less than 65, 000 jobs. It’s simply not getting any better. Those college students who are able to find work are accepting positions with far lower salaries than they ever expected. This isn’t good for those who have strong financial burdens, especially college students. New legislation might also allow debt collectors to contact those with overdue student loan payments via their mobile phones. Soon, robo-calling could be a part of many college students’ lives. It’s all part of a spending cuts package that the Obama Administration has been pushing. For those with increasing stress in their lives, the thought of debt collectors calling their cells is overwhelming. With more than 100,000 complaints filed with the FTC (and soon they’ll be filing with the CFPB), it seems irresponsible for any elected official to give companies with those kinds of problems access to cell numbers. Still, it’s part of that massive plan. The Consumer Financial Protection Bureau is currently accepting public submissions as it goes about the business of overhauling that particular financial sector. Credit score – This is a carefully formulated number that tells would-be lenders whether or not you’re a good credit risk. Your credit will be pulled for private student loans and most federal loans, too. Your eligibility is based on those or your parent’s scores. Default – This is in reference to payments on a student loan that are outstanding and overdue. Deferment – This is what you do when you request your loan payments to not begin until a certain date. Often, hospitals, government agencies or other companies will court the brightest students and one way they successfully get these soon to be graduates is by promising to pay off their student debt provided the student agrees to work for the company for a specific period of time. A deferment allows time for the graduate to get settled into his new position and while the employer sorts out the paperwork. Expected Family Contribution (EFC) – This is one term you’re likely hearing a lot about these days. It represents the dollar figures that will determine how much you must repay the government. This amount will be detailed in all of your student aid reports. Free Application for Federal Student Aid (FAFSA) – This is the actual form associated with taking out a loan. It’s issued by the federal government and is required not only for federal loans, but Pell grants and other government associated monies. 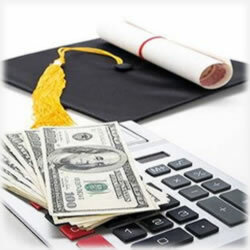 Federal student loans – These are loans provided by the government and specifically the Department of Education. The government guarantees these loans (think of it as sort of a co-signer). Federal Direct PLUS Loans – PLUS is the acronym for “Parental Loans for Undergraduate Students”. A college student’s parents can apply for these monies provided they meet certain criteria, including minimum credit scores. Forbearance: With a deferment, there is no interest that continues to add up; with a forbearance, however, you will see interest tacked on to your balance each month. Not only that, but there are some instances when interest is charged on interest. This usually doesn’t happen until some point after a student graduates. Private student loans – This is exactly as it sounds – money that’s borrowed from private lenders such as banks or credit unions. The government has no influence in these types of loans, though many college students use them in tandem with their government loans and grants. It’s often preferred over using credit cards. Repayment Schedule – Again, this is exactly as it sounds – it’s your payment plan and should include everything from the due date to the amount that must be paid each month as well as the interest you’re paying. You should also see an “expected payoff” reference. Student loan interest rates – This is the percentage you’ll pay in interest on your student loans. They’re much lower than traditional loans. Subsidized Loans – The government pays the interest on these federal student loans. This continues as long as the student is enrolled and provided all of the necessary paperwork is in place. Not only that, but these loans do not consider one’s credit history or scores. It’s based on financial need. So is a student loan in your near future? Plan on borrowing to make it happen or perhaps scholarships and/or grants? Let us know how you’re financing your secondary degree.